This 6 foot 'BG' model Wooden Picnic Table has a walk thru frame made of strong 1 5/8 inch O.D. galvanized high strength steel. Includes cross braces made of 1 5/16 inch O.D. galvanized tube for support. Tops and seats are made of pressure treated Southern Yellow Pine. Portable design for convenience. Wooden picnic tables are popular in schools, parks, and municipalities to stay within the budget. 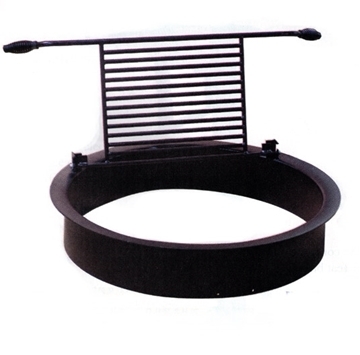 32" Round Fire Ring, Removable Flip Grate, Cool-Grip Handles, 60 Lbs.